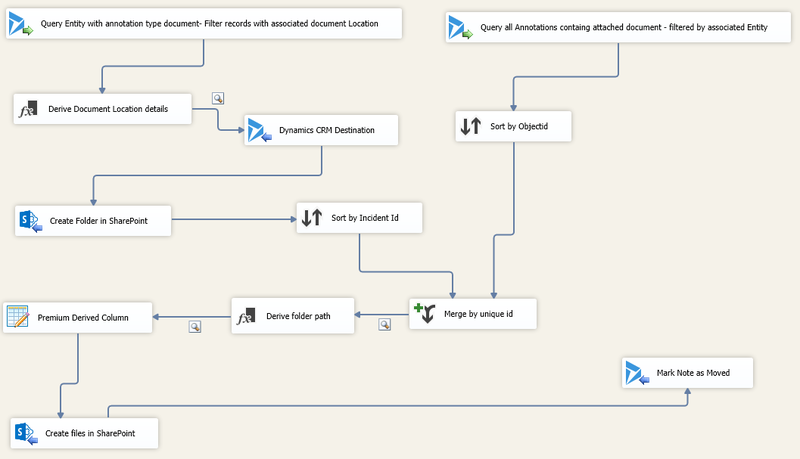 Quite often we run across a Dynamics 365 implementation where not much thought was giving to Document Management while implementation, resulting in user using Notes(Annotation) entity for document management. Notes do offer a lightweight solution for managing and uploading documents to related record but it lacks the capabilities of a full-fledged document management capabilities. Notes are also stored in CRM database, storing documents as notes could easily become a costly endeavor considering Dynamics 365 storage cost. Jukka Niiranen has written a great blog on file storage and disadvantages of using Notes/Annotation. The first step to transition from using CRM Notes to SharePoint for document management is migrating existing documents from Notes to SharePoint. This may seem like a daunting task but could easily be accomplished using SSIS package for migration. I have an SSIS starter project on GitHub which illustrates the migration for notes related to Case entity, It could be easily configured to migrate notes related to any other entity. SSIS by itself doesn’t provide capabilities to connect with Dynamics 365, for this, we use a third-party connector like KingswaySoft or CozyRoc, in below example we are using KingswaySoft connector, license and pricing details could be found here. Kingsway does provide the developer license free of cost.